Thank you for your interest in my practice. I view psychotherapy as a powerful means to build a better relationship with yourself and others – to release yourself from painful patterns and tap into greater motivation, creativity, and love. Here, you can share difficult experiences of loss, grief and shame with another, and work through the ways in which you have been hurt or felt unwelcomed in the world, so that there is more room for joy and success. I offer psychotherapy to individuals and couples, as well as parents and their (adult) children seeking to work on their relationship. I have over 20 years of experience in the field of mental health and eight years of Master’s and institute training. My practice is diverse racially, culturally and in terms of gender and sexual identities. I speak Spanish and work with bilingual clients. 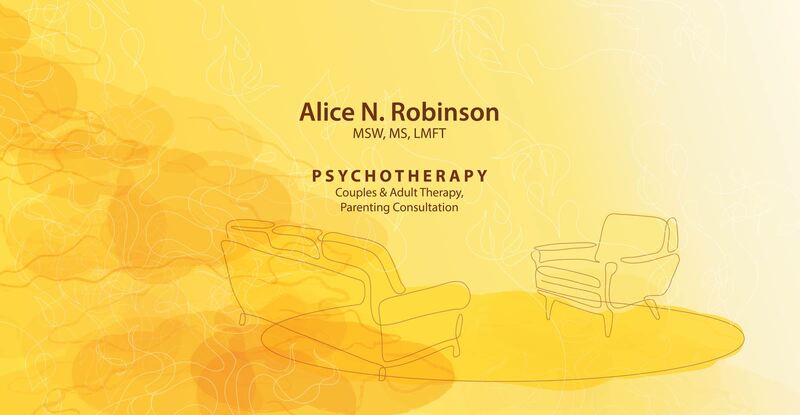 Visit my therapy page to find out more about my approach, and my bio page to learn more about my areas of expertise and professional experience. If you are interested in finding out more about my practice, please call to talk or to schedule a session: (415) 496-9863. You will find I am welcoming, curious, and responsive to your specific needs. The fee for a 50-minute session is $150. If your insurance covers "out of network" providers, I can provide the necessary paperwork. I offer a limited number of sliding scale appointments based on financial need. You can reach me by phone at (415) 496-9863. For a contact form, map & directions, please visit my contact page.